The Freesat receiver can record one channel while you watch another. Or you can record two different channels, and play back a recording you made earlier. The receiver will need to be connected to the satellite dish with two cables. If you only use one cable, this feature will not be available. Pressing standby while recording won’t stop the recording. Your Freesat box will go into standby when the recording has ﬁnished. 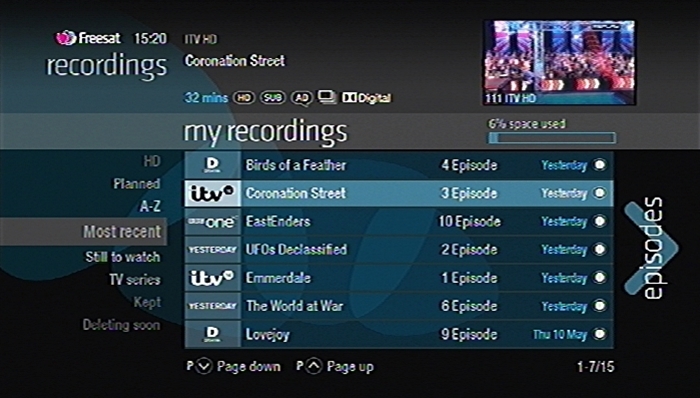 Your Freesat box automatically saves up to 30mins of the channel you’re watching, even if you’re not recording. So if you decide that you want to record a programme part way through, press R and it will record from the point you tuned to that channel. Press RECORDINGS on your remote control and navigate to the ‘planned’ section. All the programmes you’ve set to record are listed chronologically by the recording date. When a programme is being recorded or is set to record the recording icon will appear next to it in the TV guide. R shows the programme is part of a series. All episodes will be recorded and stored together. If the programme is part of a series, you will be asked whether to set the whole series to record. If the programme is also on in HD, you will be asked whether to record the High Definition version. 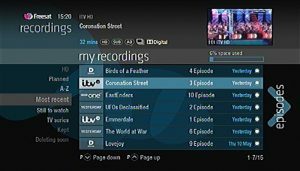 Your Freesat+ box will help you solve the recording conflict by searching the TV listings. 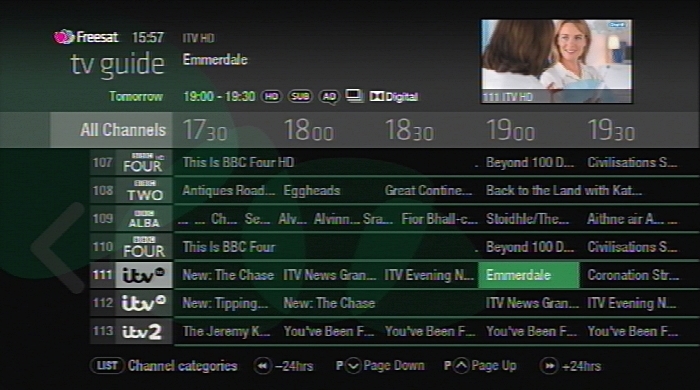 If the programme is on at another time in the TV listings your Freesat+ box will suggest it. Press RECORDINGS on your remote control. All the programmes you have set to record are listed chronologically by the recording date. 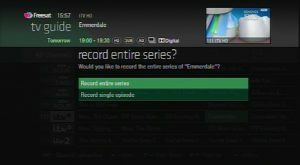 The rectangle R icon shows the recorded programme is part of a series. All recorded episodes will be recorded and stored together. Press RECORDINGS on your remote control and all the programmes you have recorded are stored here. You can choose how they are listed, either alphabetically A-Z most recent first Latest or not watched yet, Still to watch. 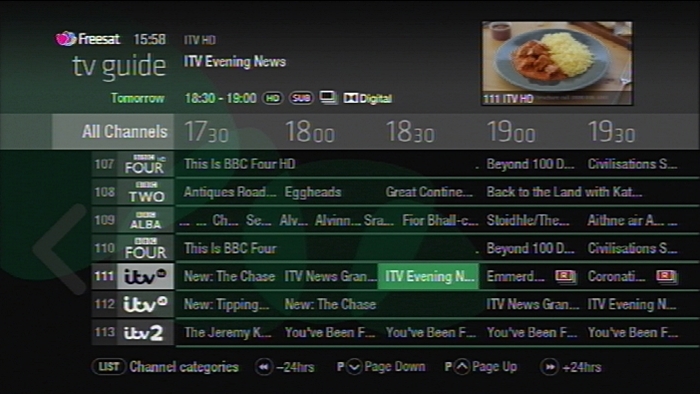 Highlight the programme you want to watch, press OK and select Watch now. If you want to go back to a recording you stopped halfway through, highlight the recording and press OK.
Watch from start or Resume. Resume will play from the point you left off. See how long you have left to watch by pressing any of the arrow buttons. Your box will automatically delete the oldest recording if there is not enough space for a new recording. Programmes that are next in line to be deleted are stored in the folder ‘deleting soon’. Press RECORDINGS then highlight the recording you want to delete, press OK and select Delete from the list.